South Korea will no longer exercise restraint in responding to the North’s provocations. As my colleague J.T. reported earlier today, North Korea and South Korea exchanged fire across their maritime border, the Northern Limit Line (NLL). This should be deeply concerning to everyone, not only because of the dangers of this particular incident but also because this is likely the new normal on the Korean Peninsula. As is well known, in 2010 North Korea sunk a South Korean warship, the Cheonan, and shelled the Yeonpyeong islands, which is near where North Korea’s artillery landed on Monday. 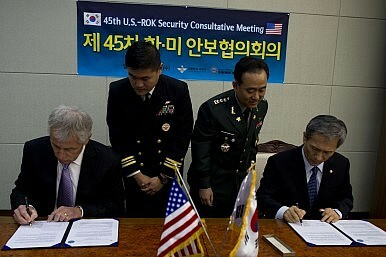 South Korea exercised commendable restraint during these twin provocations in 2010. At the same time, it pledged to never be caught flat-footed in the future. In other words, South Korea is planning on preemptively striking North Korea’s nuclear and missile sites, which will inevitably lead Pyongyang to adopt a “use it or lose it” nuclear doctrine and/or expand the size of their nuclear arsenal. This is an inherently unstable situation and could prove truly disastrous during tense crises like the one currently engulfing the Korean Peninsula. Another consequence of South Korea’s pledge to never allow itself to become the victim of North Korea’s provocations again has been the decentralization of military decisions. Soon after taking office, and amid North Korea’s obnoxious threats following its third nuclear test last year, President Park directed military commanders on the ground to respond to North Korean provocations using their own judgment. Because of this, it’s quite possible that the return shelling from ROK forces on Monday was ordered by military commanders on the ground rather by President Park or top political officials. What is more certain is that the situation on the Korean Peninsula has been growing more unstable. Indeed, Patrick Cronin, the Director of the Asia-Pacific program at the Center for a New American Security, published a report last week urging the U.S. and South Korea to do more to prepare for wartime contingencies or at least escalatory measures should deterrence against North Korea fail. It’s worth emphasizing that the blame for the instability on the Korean Peninsula lies almost entirely with North Korea. It was Pyongyang’s repeated provocations against South Korea that led Seoul to adopt a more menacing military doctrine, which is entirely understandable as no country should be forced to endure their military forces and civilians coming under repeated attack from a neighbor. Still, since nearly its inception North Korea has been an aggressive state prone to provocations. What helped maintain the peace on the Korean Peninsula after the war was the ROK-U.S. alliance’s ability to deter North Korea from crossing certain lines, and South Korea’s commendable restraint in the face of lower-level provocations from Pyongyang. Seoul will no longer exercise such restraint, and the consequences of this could be harrowing indeed.